Looking at my previous articles and thinking about the nuances of converting a mountain bike frame to a ski bike and the time it takes to convert an existing frame, it’s sort of obvious that one can move things on a bit in a “clean sheet” design. So let’s think about a design that will encompass a bit of the learning curve so far. Weight, well lack of it is everything to the day’s enjoyment. Just the lifting of the skibike to and from the car, to managing it on ski lifts, to getting it back to the car after a few too many bevies in the après ski bar; the lighter it is the more you will enjoy your day. Some of the builds we are doing are 7 kg all up, including skis, but if you can get below 10 kg then you will be alright. To put that small 3 kg difference of weight in perspective, pick something that is a bit bulky, say 6, ½ kg bags of sugar, put them in a rucksack and walk, carrying them at mid arm’s length for 15 minutes and you will understand what I mean. Oddly, the heavier skibikes do feel more leisurely once actually on the ski slopes. My first skibike, which is about 11 kg, seems to have a lovely mellow feel about things, it just seems to do everything in not so much of a hurry and I think that is just inertia slowing down all the movements of the skibike. A bit of a conundrum that one, I can equate it to comparing heavy American muscle cars to Euro sports hatches; they both get there equally as fast on the road in different ways, but once you turn into the parking lot that smaller, lighter car has a lot of benefits ! Getting a skibike to fit the chairlifts and the lift system is fundamental to getting up the mountain for a day’s skibiking. Getting clearance over the rear of the skibike to allow the chairlift to pass over it without tangling the chairlift, is there a curve where the bike can sit on the chair with the ski below, if you intend to put the skibike alongside you? Will the seat still fit under the safety bar if you sit with the skibike between your legs as some riders do? Is the top frame low enough to allow the lifts with Perspex canopies, to fully close? 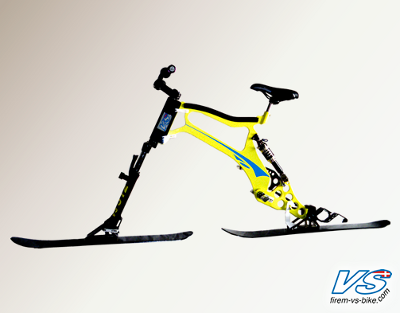 Can you take off a ski easily to fit the skibike into one of the small cabin style lifts? So many things to think about here, but with a bit of good design it can be done. Can you take off a ski easily to fit into one of the small cabin style lifts? I could name another ten requirements, but for the moment we shall just consider a basic shape that will fit most situations. Unfortunately the standard bike frame, whether as a “hard-tail” or with full suspension, is so compromised by its basic unfriendly ski lift shape, that we need to think laterally a little, but somehow still retain that “bike” feel and look which we so love. So let’s talk about Y shaped ski bikes. Why Y shapes you may ask ? Well that old Trek classic shape of the early 90’s has real benefits as a ski bike. Look at the following shape and you can see the clearances for the ski lift over the rear, that clearance carries forward of the foot pegs to allow the skibike to sit on the seat beside you, the scalloped top tube allows the safety bar to come down into its correct place. This curved Y shape frame fits the lift system well and has enough rider ergonomics to make it a very useful shape to play with as a starting point. Skibike design - why Y shapes, you may well ask?